The Wabash Tunnel through Mt Washington is probably eligible for some world record status. Built and rebuilt, but rarely used for traffic. Built in 1902-04 for the Wabash-Pittsburg Terminal Railroad (later the Pittsburgh and West Virginia Railroad). The railroad was bankrupt by 1908. The bridge superstructure across the Mon River was finally removed in 1948, and the terminal buildings (burned in 1946) were cleared in 1955. In the years which followed, various ill-fated plans have seen the Tunnel rebuilt and "repurposed" several times: as an automobile shortcut, as a possible Skybus (rubber-tired people mover) route, as a bus garage, as a possible busway route...but mostly a long, empty batcave. Jay Gould, who with his son George Jay Gould, amassed numerous railroad companies in an effort to create a single corporation with a transcontinental system. The Wabash-Pittsburg Terminal Railroad in Pittsburgh was the Gould railroad, which was intended to provide access to the great industrial hub of Pittsburgh and act as the link between the western lines and seaports in Baltimore, MD. The technical difficulty of building a railroad into Pittsburgh where all of the "good" routes had been taken, the massive costs of the construction, and Gould's speculative business practices led to the bankruptcy of the Wabash line four years after it opened. Starting with investments in small railroads in New York, Jay Gould found he could manipulate the stocks to make massive profits for himself -- usually to the detriment of the company and other investors. A similar story was played out in various parts of the United States: the Erie Railroad in New York state; the Union Pacific, Kansas Pacific and Missouri Pacific among others which stretched to the far West; and others. At his death in 1892, his railroad empire passed to his eldest son, George, who continued to consolidate and build the system. George bought the Denver & Rio Grande and the Western Pacific to compete with Edward Harriman's Southern Pacific and gain an outlet to the sea at San Francisco. In that instance Gould formed a company to build a breakwater in San Francisco Bay, creating valuable new land in the harbor but leaving the Southern Pacific terminal high and dry. Gould built a track atop the breakwater for his Western Pacific, thereby usurping the SP's access to ocean freight. George Gould's dream of a transcontinental railroad empire brought him into competition with Alexander Cassatt, president of the Pennsylvania Railroad. By the time Gould arrived in Pittsburgh the Pennsy, the Baltimore & Ohio, the Pittsburgh & Lake Erie and others had long since secured all of the obvious routes for railroads into the region. And these railroads made extensive efforts through political pressure and real estate dealings to impede the approach of Gould's connection with the Wabash lines from the Midwest. But Gould was no stranger to such tactics: as the court battles and council meetings raged on, he confidently began tunneling through Mt. Washington and building the piers for the bridge over the Monongahela which would bring the line into downtown Pittsburgh. He reportedly had enough "influence" with enough of the local officials to gain the enabling ordinances allowing the Wabash to complete the railroad, which had been under construction from west to east. Between Rook Yard near Greentree and the Wabash Terminal at Liberty Av and Ferry St (Stanwix St), the line descends at a one percent grade for 4.8 miles through some of the sharpest curves on the entire line. Between the Greentree Tunnel and the Wabash Tunnel, Bigham Tunnel was carved out on the hillside south of the present Parkway West interchange with Saw Mill Run Blvd. The tunnel's timber interior structure caught fire within the first year. The collapsed debris was removed and rebuilt as an open cut. The West Side Belt Railroad was another piece of the Gould system, which was intended to link the oceans. Though the Wabash-Pittsburg Terminal Railroad went into bankruptcy and Gould lost his empire and fortune, the railroads which were built around Pittsburgh continued on under new ownership. The Pittsburgh and West Virginia Railroad operated most of the lines constructed by Gould. Later they were acquired by the Norfolk & Western, which subsequently sold them off in the formation of the Wheeling & Lake Erie Railroad, which operates the former Wabash and West Side Belt lines today. The structures along these rail lines still have markings from their previous owners -- and indeed several streets along the route in Allegheny County are named "Wabash." The Wabash properties in Pittsburgh were acquired by the Pittsburgh & West Virginia Railroad in 1917. A November 1925 landslide blocked the city-side portal and severely damaged the first approach span to the Wabash Bridge. Passenger service into downtown ended October 31, 1931. The elaborate terminal facilities stretching the width of the Golden Triangle at Stanwix St continued to be used for freight transfers. When fires on the 6th and 22nd of March 1946 destroyed the terminal and adjacent trestle, rail service over the former Wabash met its end. The disused Wabash Tunnel became a lure for other doomed transportation projects. In 1931, Allegheny County bought the tunnel for $3,000,000 with the intention of using it as a traffic tunnel to relieve some of the growing congestion at the Liberty Tubes. A $5000 feasibility study was commissioned in 1933 to determine whether the tunnel was suitable for automobiles. The old stories say that railroaders had to lay low when passing through the unventilated tunnel, and with the major engineering project required to alleviate the ventilation problems, which delayed the opening of the Liberty Tubes, it is likely this would have been a serious consideration. 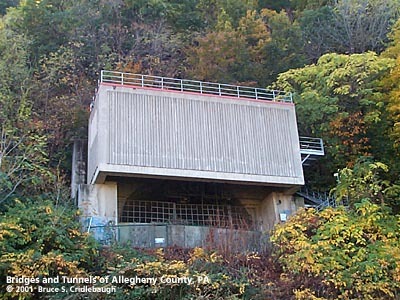 The tunnel remained dormant until the Port Authority of Allegheny County purchased the property. In 1971 the transit authority began a $6 million project to ready the tunnel for "Skybus," an ill-fated rubber-tired automated people mover system. A demonstration project of the Skybus system was built in South Park. A similar system was constructed in Morgantown, WV, for the West Virginia University. The WVU Personal Rapid Transit (PRT) System continues to operate successfully today. Cost and politics doomed the project in Pittsburgh; "Skybus" became a synonym for any public project, which died in debates and under the weight of its own plans. Between 1994 and 1997, an additional $8 million in renovations were made to the tunnel. The Port Authority of Allegheny County's West Busway / Wabash HOV Project Phase 1 connects downtown Pittsburgh to the Penn Lincoln Parkway West at Carnegie with a two-lane highway used exclusively by buses. Construction began in December 1994 to be completed in December 2001. The project was originally referred to as the "Airport Busway." The total budget was $326.8 million. Michael J. Baker, Inc., of Coraopolis, PA, was the project designer. The mainline of the busway follows the right-of-way for the former Pennsylvania Railroad Panhandle Division from Corliss to Carnegie. In 1998, as part of the $37.1 million contract to rebuild the (former Panhandle Div.) Berry St Tunnel in Sheridan, Mosites Construction Company built a new portal building at the west end of the Wabash Tunnel and updated the existing portal building visible from downtown on the face of Mt. Washington. Ventilation, electrical and communication services were also updated. In 1996, a $3.1 million contract was awarded to Kiewit Construction of Baltimore, MD, to demolish the Skybus runway system and install new paving and drainage inside the Wabash Tunnel. The subject of debate and many revisions, the connectors which will link the Wabash Tunnel have not yet been sent out for bid. On the west end, plans are for the busway and High Occupancy Vehicle tunnel to connect with Woodruff St near Saw Mill Run Blvd [PA51]. Another proposal suggests purchasing the Wheeling & Lake Erie right-of-way from Carnegie to the Wabash Tunnel and southward along Saw Mill Run Blvd [PA51]. A 1993 assessment stated the property value at $6 million; the W&LE reportedly wanted $30 million. On the downtown end, however, the debate has been fueled by the difficulty locating a landing for a new bridge across the Monongahela River. The massive stone piers of the Wabash Bridge have been empty since 1948, but have continued to sing a siren's song to those who would build a new span. Most plans have concluded that the piers would not be reused -- partly for structural reasons, but also because of the new buildings constructed during Renaissance I on the site of the former Wabash Terminal and elevated terminal tracks. A span which used the existing piers would align with the Westinghouse Building at Fort Pitt Blvd and Stanwix St. Various alternatives to bring the Bus/HOV traffic into downtown included landings in the center of Stanwix St, a too-narrow Market St and sharp ramps descending onto Fort Pitt Blvd. The latter pair of options is hindered by the protected historic architecture of First Side. There were property disagreements on both sides of the river. The Busway was originally planned to parallel the former Panhandle Division of the Pennsylvania RR (now Norfolk Southern) from Corliss to the proposed Mon River Bridge at the Wabash Tunnel. At Corliss, the compromise produced a "flyover" ramp above the railroad which connects to West Carson St. Nearer to downtown, alternate plans were developed which would add ramps from the Wabash Tunnel to West Carson St. Due to the configuration of ramps at the Fort Pitt Bridge, all downtown-bound Wabash Tunnel traffic would cross the Smithfield St. Bridge. The Wabash Tunnel reopened to automobile traffic December 27, 2004 with the completion of a bridge ramp on the downtown side. Operated as a High Occupancy Vehicle facility by the Port Authority of Allegheny County, it links Woodruff St above PA51 to West Carson St near Station Square. It is not used by transit vehicles, rather it offers cars a rush hour alternative to the other overloaded tunnels through Mount Washington. An old railroad tunnel closed for decades is one of the newest ways to get in to and out of Downtown Pittsburgh and the South Side. Port Authority's Wabash HOV Facility links Route 51, via Woodruff Street and the century-old Wabash Tunnel, with West Carson Street. It operates as HOV-2 (minimum of two occupants) during peak periods and is available to general traffic during non-peak, evening and weekend periods. At this time, Port Authority buses do not use the Wabash HOV Facility. The facility includes a 160-space parking lot, which is operated by a private company and is available for park and ride customers and general parking. Park and ride customers can also park at the lot and travel to the Central Business District via T service available at the nearby Station Square Station. The lot is open to the public 24 hours a day; seven days a week.